A “significant number” of the 831 deaths of homeless people in Los Angeles County in 2017 were due to preventable or treatable medical conditions, according to a Department of Mental Health assessment available this week. The department has been working with county lawyers, mental health advocacy groups and civil rights organizations to consider changing laws to allow social workers and law enforcement officers to detain severely mentally ill individuals who refuse life-saving treatment. Coroner’s data indicates that many of those who died homeless in 2017 suffered from cardiovascular disease, pneumonia, diabetes, cancer, cirrhosis, severe bacterial infections and other treatable conditions, according to a letter dated Jan. 10 to the Los Angeles County Board of Supervisors from Department of Mental Health Director Dr. Jonathan Sherin. Under current law, only those with mental illness who pose a danger to themselves or others or are “gravely disabled” may be held for involuntary evaluation and treatment in a psychiatric setting. The definition of gravely disabled focuses on an individual's ability to care for his or her own physical needs, to find shelter and food to survive. Supervisor Kathryn Barger had urged her colleagues in October to consider expanding that definition to include an inability to seek care due to a mental disorder, telling colleagues about a woman she had seen on the street who was bound to die soon without being forced to accept help. Supervisor Sheila Kuehl expressed concerns at the time that changes to the law could violate civil liberties. Sherin’s letter to the board said a survey of mental health leaders showed widespread support for amending the definition of grave disability. Sherin included data on homeless deaths, which have been rising at a faster pace than homelessness itself, jumping by more than 80 percent in the last four years, from 458 in 2013 to 831 in 2017. During that same period, the number of homeless individuals countywide has increased by roughly 46 percent, based on a point-in-time count in January of each year. The data did not indicate how many of those who died were suffering from a mental illness that may have impaired their ability to seek treatment. 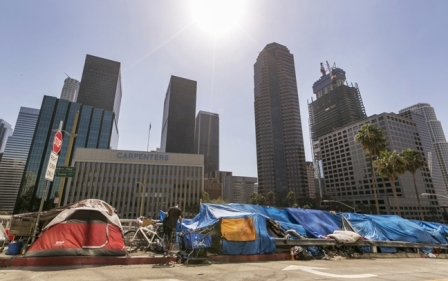 However, the percentage of homeless individuals suffering from mental illness has been increasing and an estimated 30 percent of the count's homeless population suffers from serious mental illness, according to data from the Los Angeles Homeless Services Authority. “In order to meet our ethical obligations to this population and our communities, it is our stance that the county should pursue legislation that would adjust the definition of gravely disabled to include individuals with serious physical health needs,” Sherin stated. Sherin suggested the following language: “a condition in which a person, as a result of a mental health disorder, is unable to provide for his or her basic personal needs for food, clothing, shelter or medical treatment where the lack or failure of such treatment may result in substantial physical harm or death,” which he said closely follows a definition used by the state of Washington. He argued that the change would be “constitutionally precise” and require a finding of physical harm so the criteria could not be misapplied. The matter was not on the board’s agenda for Tuesday and no action was taken.